For fans born in an age of romance which ended at least a decade before I was born, touring the football grounds of London would have been a regular pastime. Prior to the endemic violence of the eighties, the soaring ticket prices of the nineties, and the polarised pub tribalism of the television era, there is much anecdotal evidence to suggest that supporters were relatively open-minded about where they got their weekend football fix. West Ham fans might have gone to Orient or Charlton, Chelsea fans to Wimbledon or Palace. If your team was playing away in some inaccessible corner of the country, there was always another game to watch closer to home. As a child of the early nineties coming of age in the years after the turn of the millennium, my personal experience of going to a new and unfamiliar ground was not so much about romance as it was about convenience. While my dad was a Chelsea supporter and my boyhood allegiances lay with Arsenal, he had a gloriously moustachioed friend who supported Fulham and could lend us a couple of family season tickets on the weekend – an option which was both cost-effective and straightforward enough for it to become habitual. And so it was, that in March 2006, I found myself at Craven Cottage watching a fiery West London derby between Fulham and Chelsea. 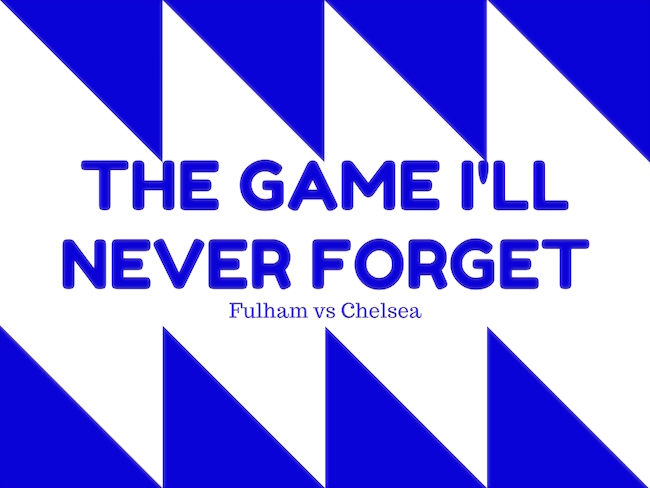 While the rivalry between the Whites and the Blues tends to be a somewhat one-sided affair – Fulham fans sing about sticking the Blue flag somewhere unhygienic, while the average Chelsea supporter is more likely to wonder who the opposition are on derby day – this was an unusually tense fixture. From the start, it was clear that Chris Coleman’s men understood there was something massive riding on the result. Fulham had lost their previous four matches and were hovering dangerously close to the relegation zone. Meanwhile, Jose Mourinho’s imperious Chelsea side were about to win the league for a second consecutive year. By this point, I was familiar with the atmosphere at Craven Cottage. Not only had I come to understand how Fulham had gained their ‘nice’ reputation – Fulham fans really are nice, in my experience – I had also cottoned on to their relatively middle-class fan base and was used to seeing them beaten at home by the like of Portsmouth, Blackburn and West Ham. Having attended intermittently for a couple of seasons, I had picked up a neutral’s fondness for the club and come to love their quirks and foibles (including their penchant for being brushed aside by top-four clubs). I certainly didn’t expect them to get a result that day, let alone record their first competitive win over Chelsea since 1979. While parts of the game have been blurred by the passing of time, it was a frantic affair. The only goal came early on, when Paulo Ferreira thumped a clearance into the shin of Cottage cult hero Luis Boa Morte and watched the ricochet ping past Petr Cech. I distinctly remember, in that moment, leaping into the arms of a complete stranger, one of the first moments that I had felt genuine delirium – the sort that’s slightly embarrassing afterwards – while celebrating. Likewise, there is an image in my mind’s eye of a sea of arms outstretched in the Johnny Haynes stand, with my dad a tiny ripple on the water, the only man determinedly glued to his wooden seat. If he had been expecting to enjoy a routine win for Chelsea clandestinely among the Fulham fans, he was sorely disappointed. The rest of the match was back-and-forth, though mainly characterised by a desperate rearguard action from Moritz Volz, Liam Rosenior, Ian Pearce and the lumbering Zat Knight. Things started to get heated late on, with Jose Mourinho – then in his spiteful pomp – glowering angrily on the touchline, reflecting a mood which a few minutes from the end led to a full-on dust up on the touchline. In among the shoving and the barging, William Gallas managed to stand out as a particularly obvious offender, and was sent off only to march down the touchline gesticulating at the home fans. There was agitation in the stands at this point, with adrenaline hanging heavy in the air. Still, for a Fulham match, what happened next came as a major shock. At the final whistle, there was a spontaneous pitch invasion by elated Fulham supporters, with fans in white streaking across the pitch and some celebrating in front of the Chelsea end. Soon enough, there was an invasion from the away end of a less celebratory nature and grown men were tussling on the pitch as beleaguered stewards attempted to haul them apart. This was like nothing I’d ever seen at a football match, though I would not be there to witness the rest of it. My dad, surely the least delighted man in the immediate vicinity, ushered me quietly out of the ground and past further scuffles on the streets outside. Not only did it seem fantastically unlikely that something like this should happen at Craven Cottage, there was something transgressive about the experience which appealed to the psyche of a teenage boy. 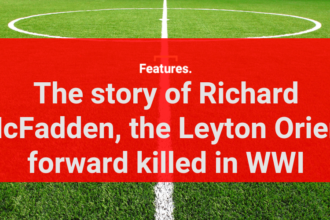 What unfolded before my eyes wasn’t just against the rules; it was genuinely anarchic, a raw version of human antagonism which – while far from the worst outburst seen at a football ground – had somehow spilled out onto the pitch. While I wish I could say my adolescent self coolly disdained this small minority of idiots, the truth is that I had that same chemical rush we all associate with in-your-face confrontation. Dodging in and out of big bald men screaming at each other we headed home, my dad no doubt faintly embarrassed by the bad behaviour on show and me, against my better judgement, a little more enthralled by football than before. The Game I’ll Never Forget is a new series on The Set Pieces. Jack Lang on Lyon vs Barcelona. Nick Miller on Nottingham Forest vs Derby County. Richard Jolly on Hull City vs Bristol City in the 2008 Championship play-off final. Alex Hess on Liverpool vs Chelsea in April 2014. Daniel Storey on Wayne Rooney’s Manchester United debut against Fenerbahce. Gavin Cleaver on Turkey vs Croatia at Euro ’96.